Mark out the unwanted areas.. 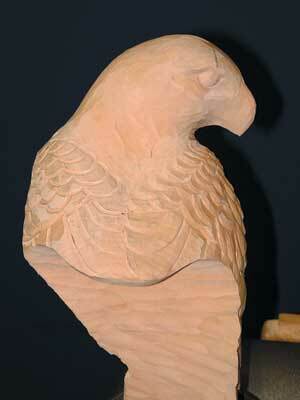 I decided to carve a goshawk bust in such a way that would allow me to easily take a mould from which to produce a bronze, and that didn't require an enormous amount of feathering. 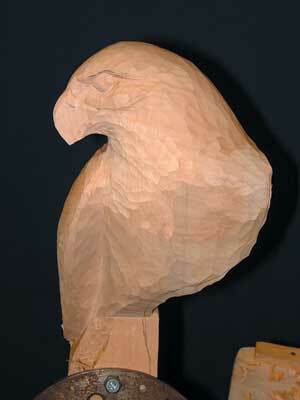 The cut-away style, which I finally decided on, also has a rather artistic quality I felt. 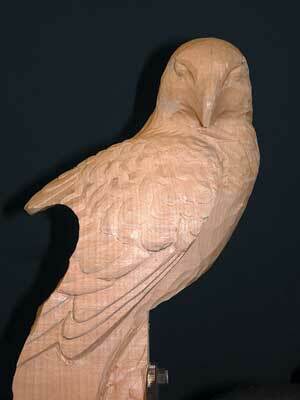 This design made it easier to source the correct size of wood i.e. it would be smaller and less expensive. 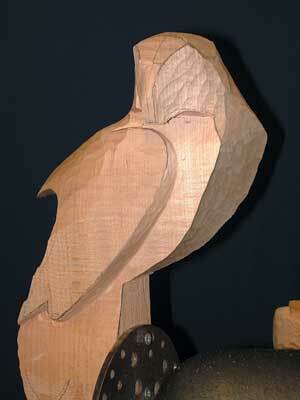 I chose to carve the piece from lime (Tilia spp. 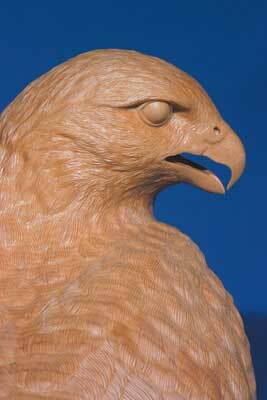 ), as it would readily take the required level of detail, and decided to mount the bird on a flat base supported by a brushed aluminium rod. As with all projects, it is important to source plenty of reference material; the internet is always a good and easy place to start. For projects involving birds of prey, I have always found falconry centres to be very helpful, often giving me the opportunity to study and photograph birds close-up. Make some simplified drawings from your photographs to use as templates and photocopy them to the correct size (see photo 2). 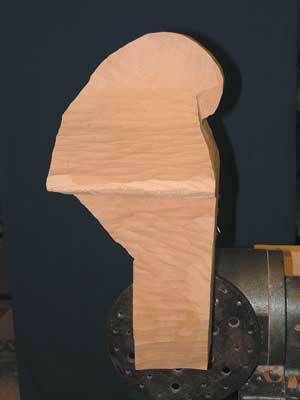 After drawing the outline of the front view on to a chosen piece of wood, remove all the wood outside of this line, using a bandsaw if available. 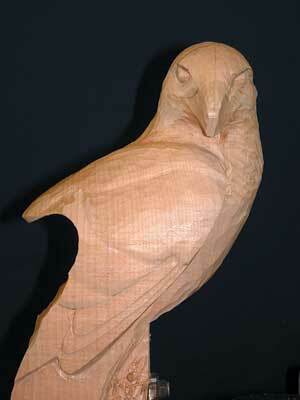 Remove the bulk of the wood, which lies outside the outline of the side view (see photos 3-4); this leaves a large block-like head, which can now be refined. 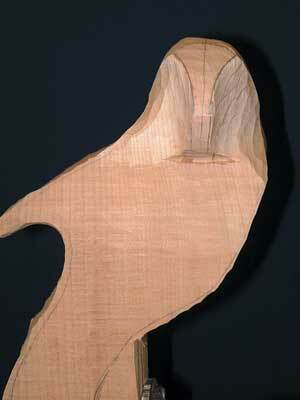 Curve the top of the head area from side to side, then mark the excess wood, which lies to the left and right hand side of the beak, (see photo 5) and remove (see photo 6). 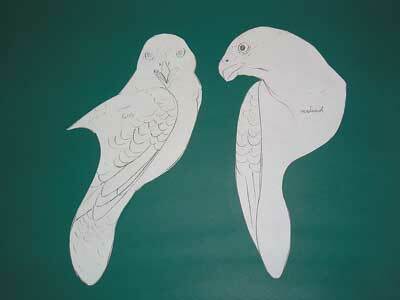 Draw the profile of the head, marking the juncture between the beak and head (see photo 7). 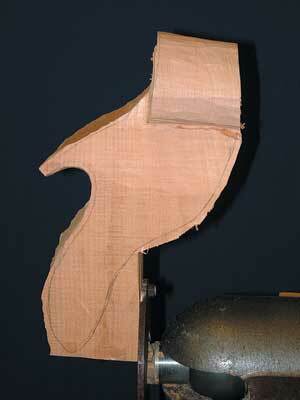 After removing this wood, draw the leading edge of the wing, right and front sides respectively (see photo 8). Remove this wood, working 90 degrees to each plane, until the cuts meet at the "wing pit" (see photo 9). Deepen this area and curve the front of the chest into it. Mark the position of the eye (see photo 10) and the lowest position of the brow ridge. The easiest and most accurate way to transfer the correct position of the eye to the other side of the head is by using a pair of compasses. Place the point of the compass on the centre of the top of the head and open until the pencil reaches the centre of the eye shape, which you have already drawn. Keeping the point of the compass in the same place - and the compass open at the same width - move the pencil to the other side of the head and draw an arc. Repeat the process with the compass point on the tip of the beak - open the compass till the pencil is in the centre of the eye, and then moving the pencil to the other side of the head, draw another arc. The point where the two arcs cross is the centre of the second eye. With a V tool, remove the wood to front and rear of each eye below the brow line - curve the lower side of the eyeball and dome the eye into these cuts (see photo 11). 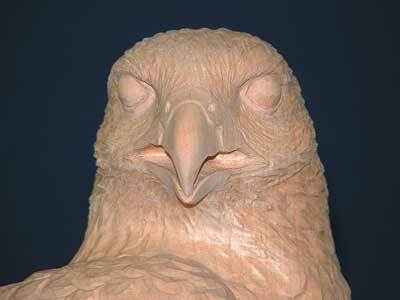 Repeat on the other side, making sure the eyes are the same size (see photo 12). 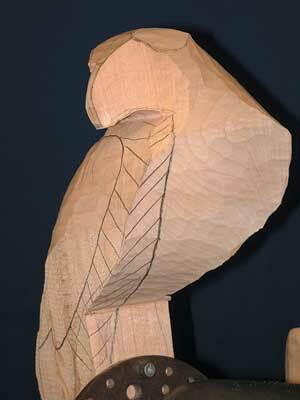 Draw the main feather groupings onto the wing (see photo 13) using a 1/2in No.10 gouge, or thereabouts. 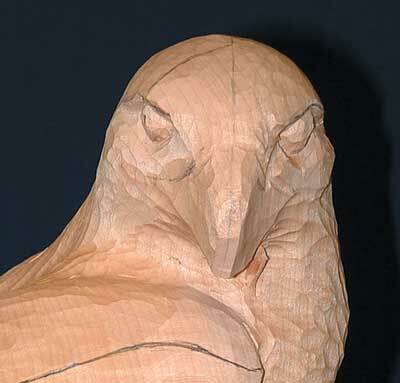 Carve around these lines and round off all sharp edges (see photo 14), except for the primary feathers, which will be undercut later using a scalpel to add a bit of shadow. 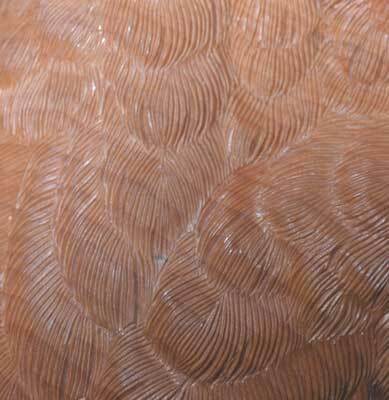 In a similar way, draw on the individual feathers within these feather groups (see photo 15) and carve along these lines with 1/4in No.10 gouge (see photo 16); once again round off all sharp edges (see photos 17-19). 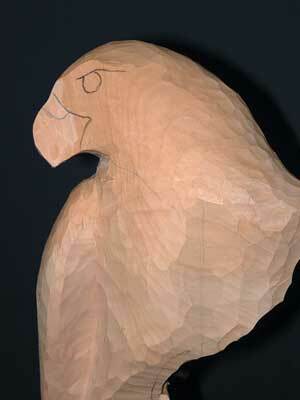 Using your head template, draw a more accurate profile of the open beak and carve carefully around this profile with a scalpel (see photo 20). I prefer a Swann Morton No.4 handle with a No.26 blade. Take care when using these as the blades frequently break if pressed firmly. 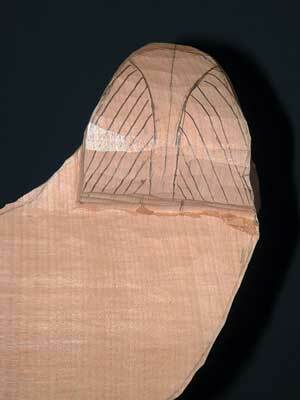 Work from both sides using the scalpel or other knife blade to remove the wood filling the space between the mandibles, until the cuts meet in the middle (see photo 21). 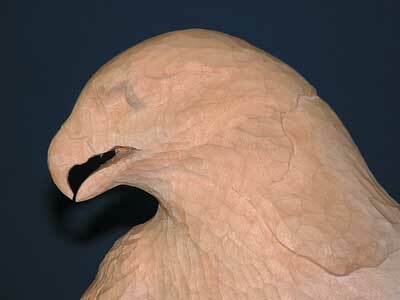 If you have access to a mini drill and small rotary burr, hollow out the inside of the upper mandible of the beak. Carefully remove the wood either side of the tongue in the lower mandible. Using an even smaller rotary burr, carefully excavate the nostrils. 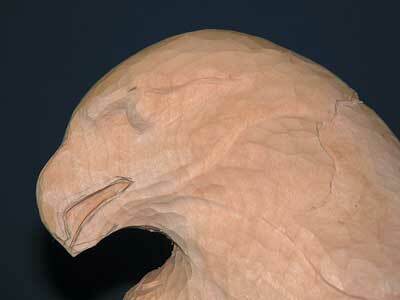 Hollow out the inside of the nostril to be larger than the opening to form some shadows within. 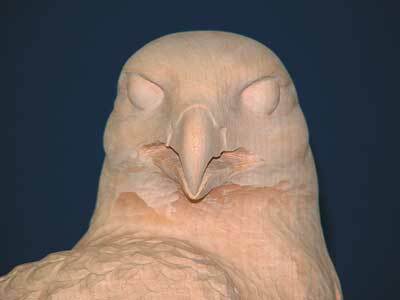 Sand the outside of both the upper and lower mandibles through 180, 240, 320 and 400 grit, and do the same with the eyeballs. 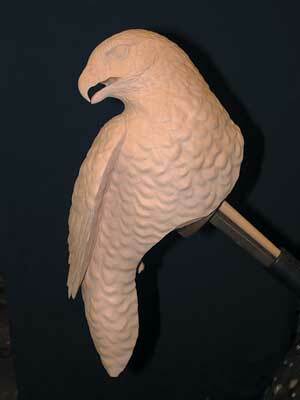 Sand the head with 180 grit sandpaper prior to drawing in the finer feather details (see photos 22-23). 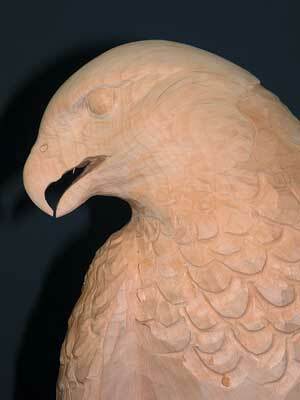 Before drawing in individual feathers, mark on to the wood the general direction flow of the feathers, particularly allowing for any twist of the head in the throat area. 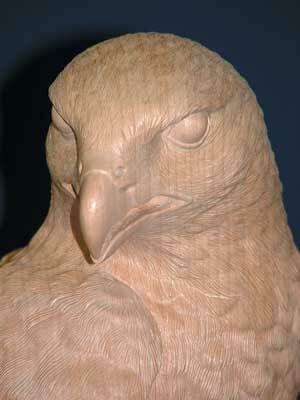 Draw individual feathers to follow these flow lines, taking particular care with changes in size and shape, so they blend with the feathers on the body (see photos 24-28). 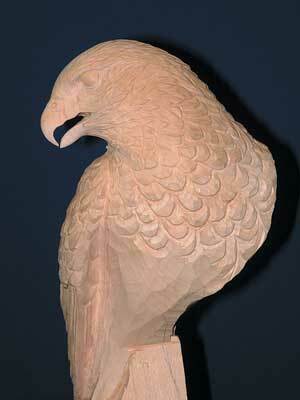 Finish carving feathers running down the body and into the leg areas (see photo 29) and once again, round off all sharp edges. 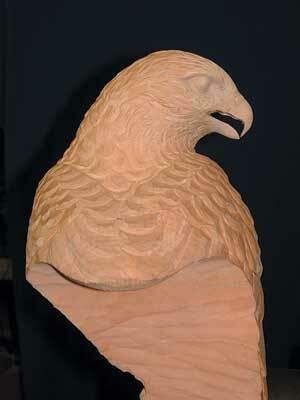 Sand entire bird to 320 grit (180, 240 and 320). 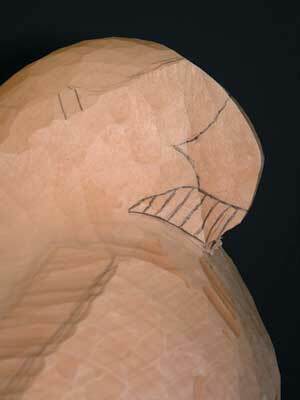 For this particular bust, I decided to hollow the inside of the body area out to leave a 6mm thick skin of wood, leaving the head solid so that the mounting rod is received by a hole into the head area (see photo 30). 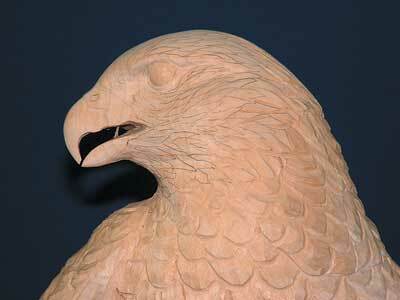 Take great care not to go right through to the feathered side, especially in the wing pit area. 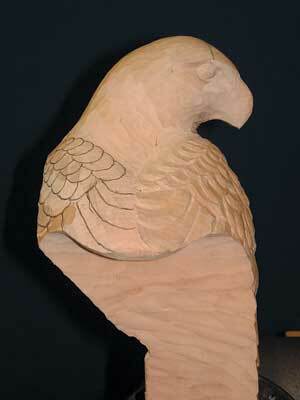 For contrast, I left the hollowed body area rough tooled. 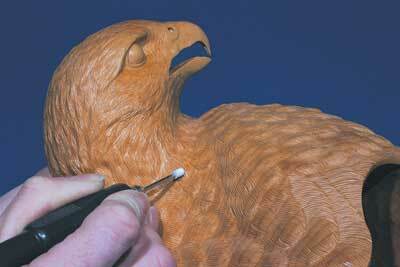 The two main methods of feather detailing I use are either a pyrograph, which burns the fine detail into the wood, or the use of small rotary stones in a mini drill. 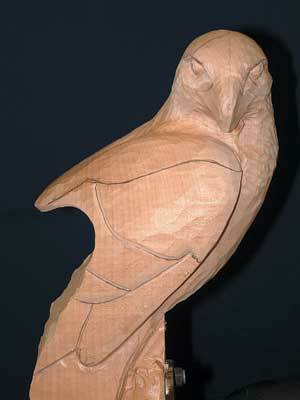 The pyrograph works by using a heated blade, which vaporises the water in each cut. This method ensures that the cut stays open. 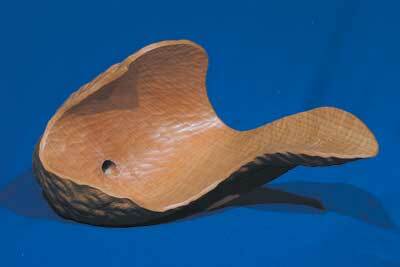 If a normal blade were used, the cut would close when painted or oiled. 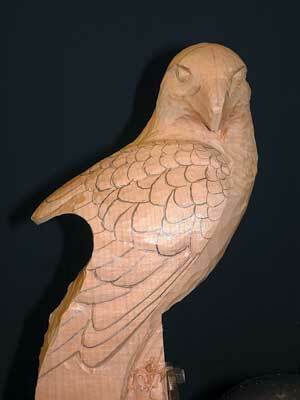 The pyrograph, however, can leave a blackened line in the wood, which is fine if the model is to be stained or painted, but as this is to be left as natural wood finish, I chose to use the mini drill and stone technique which will not burn, unless the drill is set at too high a speed (see photo 31). 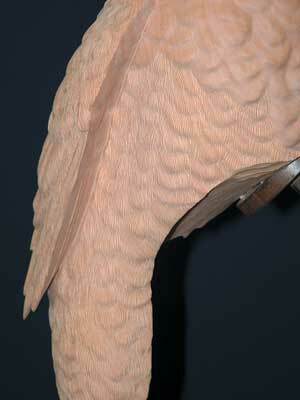 Carve the rachis first - but only on feathers where the rachis is visible - and the individual barbs, adding the odd random split for variation (see photo 32). 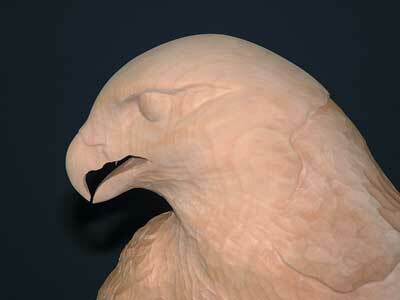 Work from the bottom of the bird upwards so each feather lies under the one above (see photos 33-35). 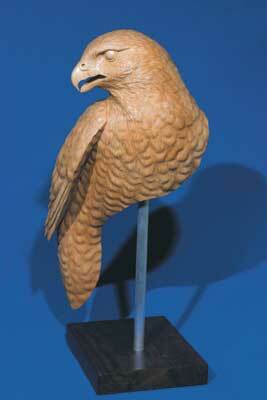 Work carefully up the entire body, taking care with the head and small delicate feathers around the eyes. 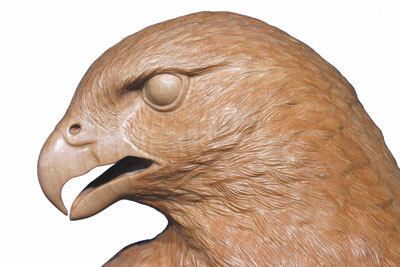 It is at this point you realise why I thought it a good idea to design a bird with limited feathering! 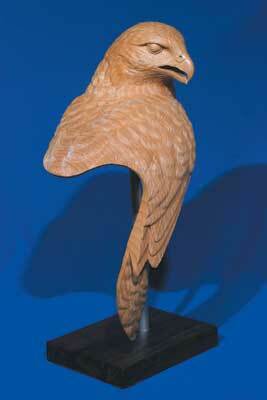 Carefully clean the dust from the carved feathers with a fine nylon bristled brush. I have used a small rotary brush fitted in the mini drill for this purpose. Before waxing, apply a liberal amount of finishing oil, making sure to get into all the small crevices. Be sure to dab off any excess oil from the surface immediately as this can leave shiny patches where the oil has dried on the surface. Two applications may be required, allowing at least 24 hours between coats. This leaves a matt surface. If a more satin effect is required, a coat of Liberon fine wax polishing paste of approximate colour match can be applied using a moderately stiff bristled paint brush, making certain to get the wax into the fine feather detail. Again leave the oil to dry for at least 24 hours before applying the wax. Leave the wax for 30min before buffing carefully with a rotary buffing brush (see photo 36). Choose the style of base that the mounting rod is going to be fitted to, making sure it has a large enough footprint to ensure stability of the sculpture. 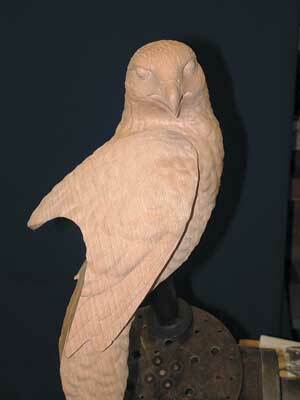 I used a 12mm aluminium rod to mount the bird, which was wire-wooled to produce a brushed effect. 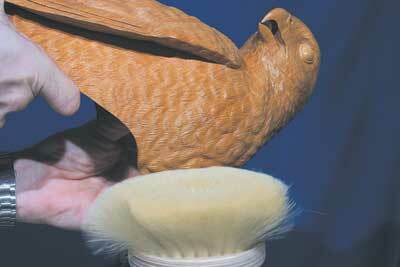 Apply a couple of coats of Jade Oil or similar, to inhibit oxidisation. 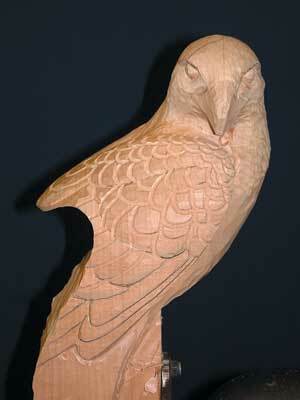 Make sure the rod is long enough to support the bottom of the bird, approximately 12.7mm above the base, and also to go into the body of the bird approximately 50.8mm. Drill the receiving hole for the metal rod in the base and sand to a fine finish, then wax polish and buff with a cloth. Assemble the base, aluminium rod and bust using epoxy resin to secure, then sit back, relax and repeat after me: "I shall never carve another feather as long as I live". "As with all projects, it is important to source plenty of reference material"